Mongolia’s good innings 2018 can be attributed to continued foreign direct investment into the mining sector, high performing coal exports and growing domestic private consumption. FDI into the mining sector remains the primary driver of the country’s growth, contributing 12.6% of GDP in the first half of 2018. Oyu Tolgoi, a copper and gold megaproject in the southern Gobi desert, is the primary destination for foreign capital. The operation is shared between the Mongolian government Rio Tinto subsidiary Turqoise Hill, which owns a 66% stake. The company ploughed $318.0 million into the mine in Q2 2018, up from the $205.2 million in investments made in Q2 last year. With work continuing to focus on underground expansion, they have committed a further $1.2bn to the mine for the coming years. Mining FDI will be critical to the development of the Mongolian economy into the medium term, as Oyu Tolgoi approaches sustainable production in 2021 and hits full capacity in 2025. Coal exports, the star performer of 2017, are back in the spotlight. Mongolian coal continues to benefit from geopolitical events in the region and its proximity to China, the world’s largest consumer of the fuel. Last year, coal exports received tailwinds from international sanctions against North Korea and environmental restrictions on mines in China’s northern rust belt, both of which served to tighten supply. This year and the next, Mongolia will capitalise on Beijing’s environmental policies. The Chinese government has sought to wean China off ‘dirty coal’ as part of a proclaimed ‘war on pollution’. Fortuitously, Mongolian coking coal is high grade with low ash and sulphur components, exempting it from this ban. Moreover, studies have put its quality ahead of that of competitor suppliers such as Australia and Canada. After a momentary dip at the beginning of the year due to customs disputes on the southern border, coal exports returned to positive growth of 1.2% in the period January-August. Finally, loose monetary policy has enabled considerable credit growth, stimulating household consumption. The Central Bank has maintained its policy interest rate at 10%, which alongside inflation of 5.7% led to a real interest rate of 4.3%. This has provided a favourable monetary environment for credit growth. According to estimates by Fitch, outstanding loans grew by 20.2% year on year in August, up from 9.6% year on year in December last year. This has driven a surge in credit to households with a knock-on effect on consumption. Household credit and mortgage provision in Mongolia is still in its infancy, at around 10% nationally in 2017. This is last point is interesting with regard to property investment. Frontier property markets are often dogged by low mortgage penetration. A favourable credit environment offers significant tailwinds to the lower and middle ends of the residential market, in which access to affordable mortgages is a deciding factor in home purchase. 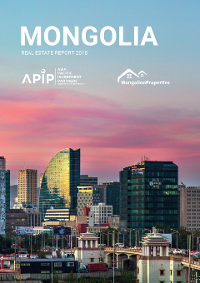 Whilst much of the early development of the city’s real estate market was driven by high-end demand from expatriate workers, improving credit access to ordinary Mongolians may broaden the scope of future projects. These developments are good news for Ulaanbaatar’s property market, which is picking up speed after several years of anaemic growth in the mid-2010s. Sustained growth into the medium term will allay investor concerns, and restore the country’s leading frontier market position.